Tonight music-streaming service Lala will be rolling out a number of improvements to its homepage and integrated music player. While the site has had a clean feel since its relaunch last October, it has also been a bit spartan – users had to navigate to various links to find their playlists and songs, and while it looked good it wasn’t as functional as it could have been. 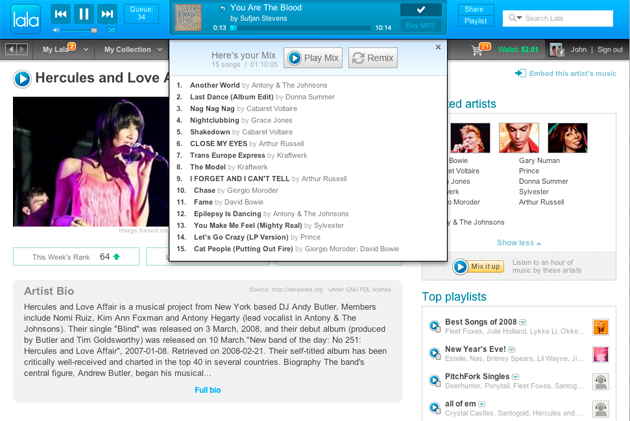 The redesign builds on the site’s persistent music player, which sits at the top of the browser window no matter where on Lala’s site they go. Users can now view a pulldown-menu with a list of songs, and there’s a similar pull down menu for playlists. Another new addition is the ‘Mix’ button, which allows users to generate a list of similar songs to the one they’re current playing (it is similar to the Genius feature found on iTunes). The feature is great for exploring new songs, allowing users to get exposure to a variety of music they haven’t heard while still retaining control over what they’d like to hear next (radio services like Pandora, while great for discovery, can still be frustrating because they only allow users to skip a limited number of songs). All in all, it’s a more usable interface, and it also looks much slicker. Other additions to the site include a revamped user profile page and improvements to artist homepages. These are all great, but we’re still itching for the day we’ll get to use Lala’s upcoming iPhone app.